four of Franconia's anniversary brews (all images courtesy of Franconia Brewing Co.). Following an announcement earlier this month revealing plans for its yearlong 10th anniversary celebration, Franconia Brewing Co. of McKinney has released images of package designs the company has created for its line of anniversary brews. Individual six packs of four distinct styles will be shipped on a quarterly basis, according to the schedule outlined below. That doesn't mean you'll have to wait to try all four beers, however, since the full range will be brewed all year long and sold in special mixed cases (see the lead image above) at select locations around North Texas. 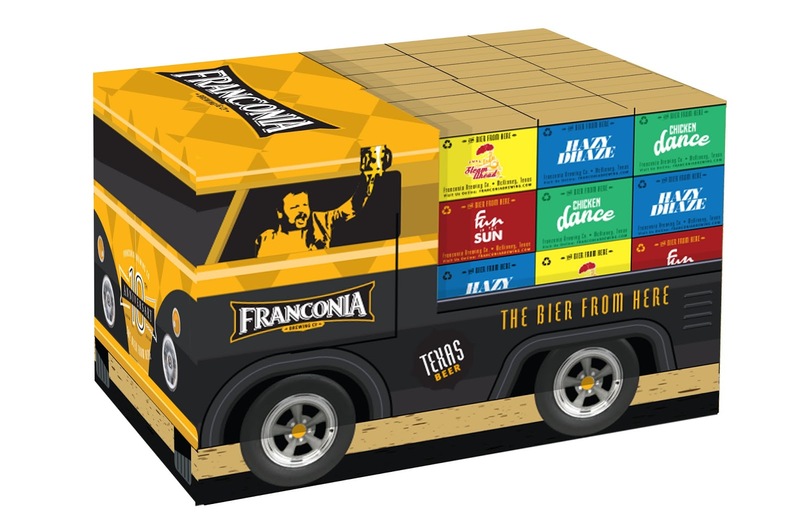 Regarding the package designs, Franconia founder Dennis Wehrmann decided to go with imagery inspired by a classic German automobile brand as a way to balance the fact that recipes for three of the four anniversary beers have origins outside of his homeland. "We chose to do something out of the ordinary with our 10th anniversary beers, only one of which is based on a traditional German style," says Wehrmann. "We're a German brewery, though, so we thought we needed to add a German element to all the beers to recognize our heritage. And, what better way to do that than to design the packaging around a German icon like Volkswagen." Images of label and six-pack carrier designs are provided below, as are tasting notes taken from pre-release samples. As for availability, look for anniversary mixed cases and six-packs of Hazy Dhaze to begin arriving at retailers towards the end of March. Hazy Dhaze (New England IPA, 6.8% ABV): Franconia's foray into the realm of New England IPAs is brewed with wheat and oats to promote the style's characteristic cloudiness, while a mix of Denali, Calypso and Lemondrop hops is used to create the beer's "juicy" element. Six-pack carrier design: Volkswagen Bus. Fun in the Sun (Belgian Blonde, 8.1% ABV): Easy drinking and sneaky strong, a traditional Abbey ale yeast infuses Fun in the Sun with a complex mix of funk, fruit and spice. Six-pack carrier design: Volkswagen Thing. Full Steam Ahead (California Common, 5.1% ABV): Franconia's entry into the steam beer category hits the nail on the head in terms of style, with its grainy malt backbone and pronounced hop presence. Six-pack carrier design: Volkswagen Karmann Ghia. Chicken Dance (Bordeaux-Aged Wheat Bock, 8.2% ABV): The brewery's original winter seasonal, Winter Wheat, is aged on Bordeaux to give the beer a woody, vinous character, with hints of dark fruit and toasted malt rounding out the flavor profile. Six-pack carrier design: Volkswagen Beetle.